Her husband and she came up for a visit (they don't live close) just to spoil my kids. They love it when they get to see Aunt Mel and Uncle Ben and so do we! I had some pain yesterday that started out of the blue and wouldn't go away. I thought it would go away if I pushed through the pain so I paid bills, took down some Christmas decorations, laid on the floor moaning, then dropped off the dry cleaning, picked up the clean dry cleaning, mailed the bills and came home again. Pain....still there. Back to the floor with a heating pad. I realized this wasn't your typical cramping. Abdominal pain with nausea and vomiting isn't good, but I had stuff to do. No time to be sick. Well, a visit to the walk in clinic and I now have a diagnosis of a kidney stone with a pain med prescription. Evidently, my kidney has forgotten that I have this thing about having a clean, organized house with the all evidence of Christmas put away. My joints are selfish little things. When another part of the body gets more attention then they do, they get a little up tight and decide to swell. Ho-hum. Hate it when this body of mine has a mind of its own. This little boy likes gum and money. He found a pack of gum in his stocking for Christmas and found money at Grammy's house on Christmas Day. 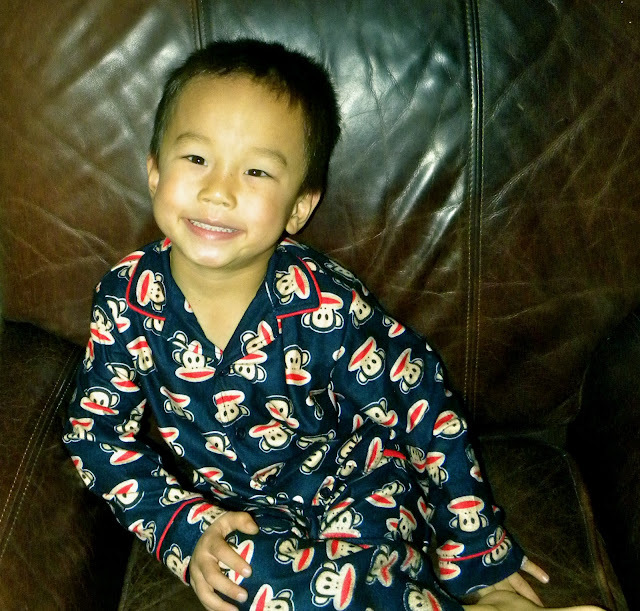 These are his favorite "Gee-fong-jiu" pants (military pants) that he wore on Christmas Day. This is what happens when you are a four year old boy, and you wear your favorite pants while chewing gum after finding money on Christmas Day. This is what happens when you are a four year old boy who has a big sister who got nail polish on Christmas Day. We started our Christmas off on Christmas Eve visiting Grandpop and Omi. I think Jake likes Grandpop! Ya think? Then we headed up to visit my family where the kids got even more presents! Needless to say, Jake had this "present thing" down pat and was pumped for Christmas Day! The boys were up bright and early. Actually, just early; not bright. Being the good parents we are, we made them wait til slightly after seven. I love the look on Jake's face Christmas morning! He examined the presents he got. At one point, I was telling him to slow down and settle down a bit. He was just shaking and was so excited! He definitely liked his bucketloader. No, not a real fong-o-jia, but he really liked it! The big kids got electric scooters for Christmas. I say "big kids" because Eric has enjoyed them too! Then we headed down to Grammy and Poppy's for more Christmas presents and dinner. Whoo! Those kids are spoiled! Ally and Grant got a bunch of spy gear for Grammy and Poppy. I think Pop can join their crew for sure. Let us know if you need a good spy....we rent them out.....cheap! Me? Oh, you want to know what I got? I'm so glad you asked! I got a Nikon D3100 for Christmas with a big fancy schmancy lens and an amazing flash that is going to take some time for me to figure out. BUT, when I figure it out.....watch out! I going to have some fun with that! Ahhhh, chaos! This isn't even all of our chaos either. The joy of Christmas! Now, gotta run and play with my new toys. Funny thing how we get kids as Christmas presents. Eleven years ago today, I found out I was expecting Allyson. I had a routine visit at my fertility specialist expecting nothing. It never occurred to me that I could be pregnant despite the fact that I was so tired I laid down on a bench at the mall while Christmas shopping. I had a routine ultrasound that day. For those of you that have been through fertility issues know what I'm talking about. The room got very quiet, my nurse had tears in her eyes, and my doctor's eyes were as big as saucers as she was picking her jaw off the floor. My first thought: "Great! Now I'm dying. We've fooled with my hormones too much." My doctor told me to look at the dot on the screen. Yes, I saw the dot. It was definitely a new dot. Now I KNEW I was dying since I had a tumor! We must have great things happen this time of year because last year on the 22nd (yesterday), the stork visited us in the form of the FED EX van delivering our LOA. Even now, when the FED EX deliverer visits my house, she always stops to chat with Jake. Must have been special for her too! Dessa Bell and One Other Cute Bell! The kids had their Christmas school play tonight. Allyson is enrolled as a homeschooler so she can participate in things like this. She had a lead part in the play. She played a bell named Dessa Bell. Now, if you know Allyson, you know singing and talking in front of a crowd is completely out of her comfort zone. It took a lot of encouragement and maybe a chocolate bribe. Wow, I know I'm the mom and all, but I was so incredibly proud of her. She did so well and spoke out the whole time. She had one small line of a solo as well which Eric video taped....but only HER line. The video is kind of funny, but listen to my girl's sweet voice! SO SWEET!!!!! Grant is our singer in the family. Honestly, if no one showed up for the play tonight, it wouldn't matter a bit. Grant could carry every single part. He literally knew every line of every part and every song. He mouthed it all during the play. He does love to sing! Seriously, how sweet is he? Allyson's character was supposed to be silly and mismatched. She did a great job with the outfit! If you ask Jake what he wants for Christmas, he will tell you a "real fong-o-jia". And since the last Santa didn't understand Mandarin, he told the next Santa that he wanted a "real excavator" just in case there was any question or language barrier. We've told him over and over that real excavators are very expensive which he sees no problem with. After all, we told him he would be getting new toys. Well, should be interesting to see if he will be overjoyed with our version of an excavator or if he's going to want a one-way ticket back to China to sit in Chinese Daddy's fong-o-jia! BTW, don't you just love the bamboo scaffolding in the background! I've been crazy busy lately which left little time for blogging. I realized my lack of blog life when even my husband mentioned it. Allyson has a part in a Christmas play and we've been going to practices as well as my usual helping out at school. Top that off with helping Ally get her gifts ready to give, laundry, dinner prep, and my urge to clean, clean out, simplify, reorganize my house. Maybe the urge came because we sold our hot tub (finally!) and now have an empty space.....a dirty space, but empty! I was rushing out at 6:30 tonight to head to the gym. I think I had about 3 minutes left before I decided to forg-e-da-bout-it and stay home cleaning things out. Oh yeah, I even decided to FINALLY put my "old" address book into my computer address book. 'Bout time, right? Anyway, I was off to the gym and got to the front of the development before I realized that instead of picking up my bottle of water, I took my house phone. HUH? Weird, right? My mom buys the kids Christmas pajammies every year for them to change into for the ride home on Christmas Eve. (We travel around visiting family on Christmas Eve). I have yet to get them all together in their jammies, but Jake had his on. Don't you think he looks like the Paul Frank monkey when he smiles? He matches his pj's! Allygirl had an orthodontist appointment this week, and we took the opportunity to visit the Chinese market. She picked out some noodles for her and Jake and asked for mooncakes. I'll be the first to admit, these are so much prettier than mine! Of course, I don't have any fancy schmancy molds either. Ally really loves these little gems filled with red bean paste. Jake enjoys them as well. Actually, I think he just enjoys the sugar filled red bean paste! After all, he does love a good red bean paste Popsicle. The green bean popsicle is still number one though. Grant has no interest in trying them. He doesn't branch out and likes to stick with the things he knows are good. Allyson enjoyed some of the benefits of homeschooling this week. Just the two of us went out in the morning to drive around and stop at places for her to try out her photography. She's been using her digital pocket camera as well as practicing with mine. She's quite the crafty girl ~ cooking, guitar playing, crafting, baking, photography. I love her 11 year old self despite her preadolescent moodiness. She posts some of her pictures on her blog. But I noticed these in her file on the computer and thought I brag a little. I'm her mom......I'm allowed! Not bad for a beginner eleven year old! Today, Jake has been going on and on about his Chinese house, a description of it's door, it's tire (he played with an old tire a lot), it's couches, it's jie jie's, and Chinese mommy's bike. Once he starts talking, I rarely even ask a question as he just talks and talks. I wish I could get him talking on video, but he just clams up when I take the camera out. "It took a long time for me to get a new Mama and Baba." You know, for a child, one day seems like an eternity. Can you imagine what four years feels like? It makes me wonder how many nights were difficult for him. How many nights did he not understand what was happening to him? How many nights did he cry without someone to hold him or comfort him? What was going through his head? Did he think that switching from orphanage life to foster family life and back again was normal? Did he ever think that he was forgotten about? When he cried, did he know that it was a mom or dad that he was missing? Did he understand why he was sad and why his heart was aching? The questions swirl in my head even though I realize they will never really be answered. Soon, Jake will forget some of the beginnings of his life. Thoughts and memories will become fuzzy for him all too soon. He will no longer be able to tell me the memories he has. I remember when Grant came home from Kazakhstan. He had scar tissue in his ear canals that made it difficult for the pediatrician to examine them. The scar tissue was from ear infections that were left untreated. I'd be lying if I said that this didn't still bother me today. My point is that you never want your kids to suffer physical or emotional pain. As a mom, you try to keep pain of any kind away from your child. But knowing that your children suffered without you to comfort them, makes a heavy heart. Knowing that there were times when they needed me and I wasn't there is difficult to think about. I know, though, that God knew every pain, every sad heart, every confused thought, every feeling of being unloved and rejected that the boys may have experienced. He allowed them to be in the situation that they were in. After Jake stated that it took a long time for him to get a new mama and baba, he innocently asked me "WHY?" in his sweet, little voice with no accusations against my inability to get myself to China faster than four years. The only reasoning I had for him was that Jesus knew right where he was all along; that Jesus knew that he was in China waiting for new parents; that Jesus knew that we were coming for him when he turned 4 years old, and that Jesus wanted him to live in China before he gained a new family. Jesus knew when he was sad or happy, or hungry or sick and that he was taken care of until we could get there. 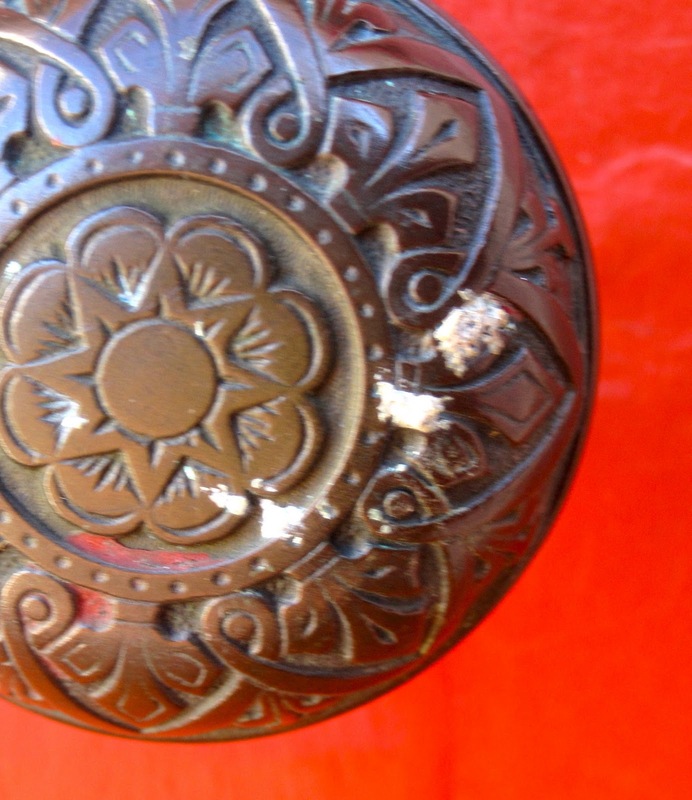 God's timing is difficult for even the most religiously insightful adults to understand. And yet, with child-like faith, Jake accepts my conclusion as to "WHY" he was waiting so long. He moves on to play with his tractor while singing "Jingle Bells" leaving me with a burdensome heart and questions left unanswered requiring my faith to step up and accept that Jesus knew and cared all along. How quickly we've come up on the 8 month mark of having Jake home. He's changed so much that it's hard to believe. The first two pictures were taken when Jake first came home. He looks like a baby. So young with that baby face. See how he's changed in these next pics? Not as much of a baby face! He's a little man now telling me that I need a new tire so if I'd just buy some, he'll put them on for me ( "Cause I know how, mom.") Good to know my son can change my oil and put on new tires for me. Like I said, all grown up......sort of. He pretty much thinks he's "hot stuff". Of course, I think he's "all that and a bag of chips!". How come the days with young kids seem soooooo long, and yet, the months and years go by so fast? Ally's study skills, anatomy, and history are officially on break for Christmas. She has a vital lung capacity project she's working on over the holidays though. Grammar, Literature, Math, Spelling/Vocab., typing, and photography are still happenin'! We've had some "talks" about doing are best even when we don't feel like it. And, honestly, math is a thorn in our flesh, but we are trudging through. I've still been scouting out what curriculums other schools are using. She has a part in the upcoming Christmas play at the school she is registered in as a homeschooler. She's also playing on the basketball team too! I'm hoping she'll be willing to play some songs on the guitar for family at Christmas. Ally can be a bit shy in situations, and we've been working on that this year. As well as working on manners and etiquette. I've been encouraging her to be more independent to boost her confidence a bit. For example, at the beginning of the year, just going into the post office to mail a letter, would have caused her to slump her shoulders and meekly ask for a stamp. Not anymore! She's been taking charge on different "everyday life" kind of tasks and doing great. She's definitely gained confidence so far this year. Ally is growing in so many ways. I have no idea where she put the 8 pounds she gained in one year, but they must be somewhere! She is so tiny! At her pediatricians visit, her increase of 8 pounds and 2 inches put her in the 10 percentile for weight and the 25 percentile for height. Definitely petite! Jake has been leveling off on his weight gain. He still enjoys food a lot and has days when he literally eats all day long (2 breakfasts, snack, 2 lunches, snack, snack, snack, dinner, seconds, then snack!). He's a healthy eater and doesn't really care for bread or fried foods. Funny thing is how tall he is. I should check to see what percentile he is in now. I was helping out at his preschool and noticed as he was lining up with the other children that he was one of the tallest in the class! When you undress him, though, you can still see every rib and those skinny, muscular legs. In China, I remember how badly his pelvic bones protruded out. Those are slightly more hidden now! Grant is our tank. He is 100% Kazakh! He doesn't have any fat on him. I think God made him with lead. He's our die-cast figure of a boy. Several weeks ago, I went to pick him up and plop him on the counter. I quickly realized, there was no possible way of moving him. Being one of the shorter kiddos, he's stocky and solid. I love those Kazakh guys! I was visiting Kat's blog who then directed me over to the Stuff Christians Like blog where I found this video from North Point Community Church in Atlanta. Right now, you're thinking I just sent you all on a wild goose chase, aren't ya? Their worship team had some fun and did an entire Christmas song set via iPads and iPhones. Maybe I'm a geek, but it is so cool. You've GOT to watch it and stick around for the last song. Sunday after we drove home from NC, picked up the dog and the tree (thank you McD family), unpacked, and did laundry, we set up the Christmas tree and got to work on decorating it. Jake was not as concerned with the actual act of decorating as he was playing with all the new toys ("ornaments"). Then, to top it all off, Eric set up the Polar Express train underneath it. Oh my, does he enjoy it! He's pretty proud of the tree too! As we were walking into Walgreens yesterday, Jake became so excited that he could not get his words out fast enough. He was trying so hard to tell me something as he was pointing to the side of the building. His eyes were lit up and he was stuttering a mile a minute. He kept pointing saying, "Chinese mommy have that! ", "I help Chinese mommy with that!". He was pointing at the Blue Rh*no propane tanks. I asked him a little more about it (and of course sounded really excited too as I didn't want to disappoint him!). He said his Chinese mommy used that in the house to cook with. Yikes! I asked him if he was sure she used it inside the house, and he mimed out how to hook it up and cook! He seems to know how to hook it up and use it pretty well. Another little tidbit on Jake's abilities that I had no idea about. He can cook indoors with a propane tank, shuffle cards like a Vegas dealer, play a pretty mean drinking game, and toast like a 60 year old man! He is definitely an old man in a 4 year old's body. It's interesting to see how certain things set off a memory for him. Eight months home, and he is still remembering things like when he went to work with Chinese Daddy and saw the big trucks, when he cut his finger with a knife while trying to cut an apple, when Chinese mommy cut the heads off the fish they caught for dinner, propane tanks, Chinese mommy's noodles she made for breakfast, when Chinese mommy cried with Chinese daddy left, jiu, jiu and more jiu, and on and on. He frequently will tell me he did not have a toy, but tell me about a little motorcycle that sat on a table he was not allowed to play with. Then there's the tire. Evidently, there was a flat tire that we would roll around outside and roll it into the house as well. Jake really enjoyed doing this as he talks about it frequently. Part of me REALLY wants to have been there to see how his life was and part of me thinks it just may be better not to know. Culturally they do things so very differently. Things they may think are fine for a child, I may not think are appropriate or even safe. I think Chinese mommy was not a particularly loving, hands-on type mom which is the Chinese way. This does bother me when I think of it. Even though it is in the past and we can always move forward, it is important to remember all of these memories, good or bad, as it is what makes Jake, well "Jake". I saw this idea on McMama's blog and thought I'd give it a try with my Denice the Menace. He loved pushing the bulldozers all around in the rice in my old pan. I was thinking it was a great indoor activity for when the weather is too cold and windy like today! We're in the thirties up here with some major wind going on (BLAH!). However, I'm thinking that McMama must have some boys that are slightly more subdued than Jake. His rice went everywhere despite me telling him to keep it in the dish several times. Now look, I expected rice on the floor, but Jake uses a lot of GUSTO and rice is now in more crevices than I can count. At least he enjoyed himself. Maybe next time I'll try dried beans. Any good blustery day activities from you all? I'm starting to lock myself in for the winter. On Saturday, we got all gussied up and fancied up to see my cousin get married. Jake even shaved for the occasion using the room key card. That boy can't wait to grow hair on his face and chest! We had such a great time the weddin'. Seriously, it was so nice and even snowed in NC just for her, I'm sure! Still hard to believe she was old enough to marry considering she was in my wedding 14 years ago. But, she is all grown up. Told you all she was pretty! They make such a great looking couple, and her new hubby is super cool too! I'm sure he fits right in to our crazy family. When Jake saw her, he said, "Mom, you love the princess?"! So cute. I guess all the Disney princesses rubbed off on him, and Elisa is truly a princess! It even snowed just for her wedding day. Not a great pic, but I was freezing in the car when I took it! She had such a sweet dance with her dad. Ally loved dancing with her aunts. When we got in the car, she said, "Mom, I had SUCH a fun time!". The boys weren't big dancers. (Usually Grant is) They rested a bit off to the side. Grant got a nap in so he was ready to play dominoes with his aunts later that night. A HUGE Congratulations to Elisa and Steve! We love you! My beautiful cousin is gettin' hitched. Let me just say, the groom is one lucky man because the bride is drop dead gorgeous and has the personality to back it all up. I can't believe she is old enough to get married because that means, well, I'm old. Can't wait to see her and the rest of my family though! Have you all read Mary Beth Chapman's book Choosing to See ? I ordered it from our library about 4 weeks ago and since all the copies were in use, I just picked it up today. I'm on chapter 4; stealing in minute I get to read a few pages. It's hard to put down. 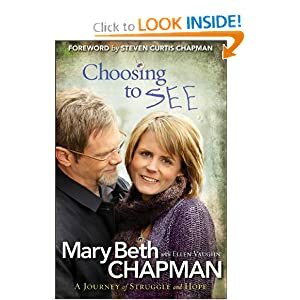 In case you are unfamiliar with the Chapman story, Mary Beth's hubby is a Christian Contemporary writer and singer. They have 3 bio kids and had 3 little girls from China. In 2008, one of their sons was pulling into the driveway and did not see his little sister there. It was a terrible accident that sent little Maria to see Jesus. She was only five years old and was a virtual twin to one of her "China sisters". I cannot imagine the grief all around that the family was/is going through. What has surprised me though, is that Mary Beth starts off the book, not dealing with the tragedy, but backing up to the beginning- the mistakes she made as a teen, her difficult marriage in the early years, the financial stress, depression, and family conflict. She puts it all out there without glossing over reality. She certainly keeps it real. Don't run with chopsticks in your mouth. Stop wrestling! Your brother is tapping out! Let me get that boogie for you. I'll keep shopping until you all start to behave! Stop peeing on the bathroom floor. Don't store your pretzels in the hallway table. Take that bag off your head! Stop drinking the bath water. No, you cannot have a latte today. No, not today. I'm cooking dead cow tomorrow. Wordless Wednesday: I know, I know...Enough Already!